Telescopes are available in many different versions. The most well-known telescopes are the refractor (also known as the dioptric telescope) and the reflector, which is also referred to as a reflecting telescope or a Newton telescope. In addition, there are Catadioptric telescopes, Dobson telescopes and GoTo telescopes. All these telescopes have their own advantages and disadvantages. We will discuss these advantages and disadvantages below, enabling you to choose the telescope that suits you best! Refractor telescopes are preferred by many amateur astronomists, for this telescope offers sharp, diffraction-free and high-contrast images. The refractor telescope is mainly used to observe moons, planets and stars. The refractor also yields surprisingly bright images of the brighter Messier, NGC and IC catalogue objects. The advantages of a refracting telescope are more light transmission, its longevity, its ability to observe more details and its magnifying capacity. Refractor telescopes are able to transmit up to 90% of the collected light. This figure substantially differs from the 77% to 80% light transmission of reflectors and the 64% to 75% transmission of Catadioptric systems. Refractors are very durable as well. This is not the case with reflectors and Catadioptric systems which annually lose 1 to 1.5% mirror surface reflectivity because of slow oxidation of the aluminium coating. In favourable weather conditions you will be able to observe more subtle lunar and planet characteristics (with more easily observable contrast range and more sharp details) with a simple refractor than is possible with reflectors and Catadioptric telescopes. Refractor telescopes are better capable of showing stars that are close to each other. Because the moon and the planets are all shone upon by the sun, the light collection capacity is not as important as magnifications in the solar system. The disadvantages of a refractor telescope are its considerable chromatic aberration or ‘spurious colour’ and its price (bigger refractors are expensive). It is very easy to answer this question: the biggest advantage of a reflecting telescope or reflector is its price/quality relationship. A Newton telescope will buy you more observing performance than any other telescope. A catadioptric (compound of refracting/reflecting) telescope combines many of the best properties of the refractor and the reflector, as well as some of the less good properties. A catadioptric telescope is lightweight and easy to set up and store. A catadioptric telescope is not hindered by coma (unlike the reflector) or chromatic aberration (like the refractor). Stars therefore appear crisp and coma-free in your field of view when using a catadioptric telescope, and no coloured halos masking vague details and colours will develop around stars and planets. The disadvantages of a catadioptric telescope are its cost, the low contrast range of the moon and planets and its less than beautiful star splitting. Sometimes they may be difficult to use. Many hobby astronomers prefer the Dobson telescope. Most Dobson telescopes are big but they still fit in your trunk. The Dobson telescope has many advantages. The price of a Dobson, for instance, is often good and the Dobson telescope does not weigh as much as other telescopes of the same size. In addition, the Dobson telescope is easy to transport and set up. 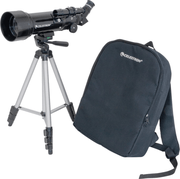 It is also easier to use than most telescopes and it has a compact mounting system. The telescope performs very well during deep sky observations with a dark sky. Despite its size you can easily take the telescope with you to a remote spot without city lights. Since it is not equipped with a motor and the celestial bodies cannot be easily found, the Dobson telescope is not suitable for astrophotography. In addition, for telescopes with azimuth mounts it is difficult to find objects that are right above you (zenith). Improvements in the material carrying the azimuth and the design may lessen these problems but not completely eliminate them. A GoTo-telescope refers to a kind of telescope mount, including the software, which automatically points the telescope at astronomical objects selected by the user. Both axes of a GoTo mounting system are motor-driven and computer-controlled. This way, you are able to pre-program what you want to see! The biggest advantage of a GoTo telescope is its ease of use. You do not need to look for the objects yourself: the built-in motor will do this for you. Do you prefer to embark on a journey of discovery through space yourself? Then we advise you not to choose a GoTo telescope. After having read all the pros and cons of the various telescopes you will undoubtedly be able to make your choice. 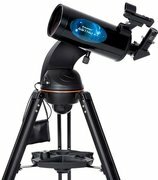 You can always contact the telescopeplanet.co.uk customer service department, should you not know which telescope suits your needs or need further advice on the use of your telescope. We are the experts and always available to offer a helping hand. Maybe a pair of astronomy binoculars?